Antiques and Jewelry By The Sea. 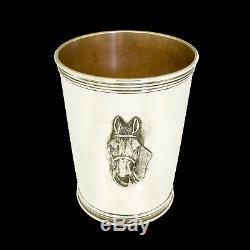 Vintage Sterling Silver Benjamin Trees Horse Mint Julep Cup No Monogram Kentucky. 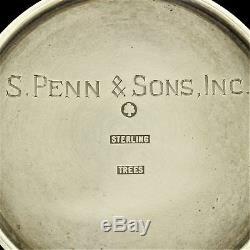 Details:Beautiful vintage sterling silver Mint Julep cup made by Benjamin Trees of KY and retailed by S Penn & Son's. From a local estate, one owner, no monograms either applied or removed and these have been stored for many years. No dings or dents that we could find, may have missed a tiny one - please bear this in mind when purchasing. Interior shows patina - we would advise a cream silver cleaner, no dips as it strips the original warm finish. Maker: Trees Weight: Between 139 Grams and 142 grams Dimensions: Approx 2.75" W x 3.75" H x 2.75 D As with all pre-owned items there will be some signs of age and use. Pre-owned jewelry and collectibles often have imperfections. Unless noted we do not clean or repair any items we sell. All items will be in the condition we received them in and may have stains, scratches and/or tarnish. All of our items are thoroughly tested for authenticity by a variety of methods, including X-Ray and are guaranteed to be authentic. We want to make sure your item reaches you without incident! We do our best to guarantee the item that leaves our store is in the same condition when it arrives. The item "Vintage Sterling Silver Benjamin Trees Horse Mint Julep Cup No Monogram Kentucky" is in sale since Sunday, September 9, 2018. This item is in the category "Antiques\Silver\Sterling Silver (. The seller is "coins-jewelry-collectibles" and is located in Fort Lauderdale, Florida. This item can be shipped to United States, Canada, United Kingdom, Denmark, Finland, Malta, Australia, Greece, Portugal, Japan, Sweden, South africa, Belgium, France, Ireland, Netherlands, Poland, Spain, Italy, Germany, Austria, Bahamas, Israel, Mexico, New Zealand, Switzerland, Norway, Brazil, Chile.